Now the blockbuster movie is a sensational new conversion hit for Atari System I. The player takes the role of Indiana Jones in his quest to recover the sacred Sankara Stone that once protected Mayapore, a remote village in India. He must also free the children from Mayapore who have been enslaved in the evil Pankot Palace. The palace is the secret worshipping grounds for the Thuggee death cult. Mola Ram, the ruthless High Priest has forced the village children to dig in the Thuggee mines for precious gems and the other missing Sankara Stones. Wave 1. The player controls Indy in the mine caverns, a labyrinth of narrow passages, ladders, chutes and conveyor belts. Indy must free the children along the way and escape the pursuing Thuggee Guards. Wave 2. Upon reaching the tunnel entrance, Indy rides a mine car still trying to escape Thuggee Guards and avoiding derailing on the unpredictable tracks. In the higher levels of this wave, Indy must watch out for missing rails, jumps, giant bats and a Thuggee Giant. Wave 3. 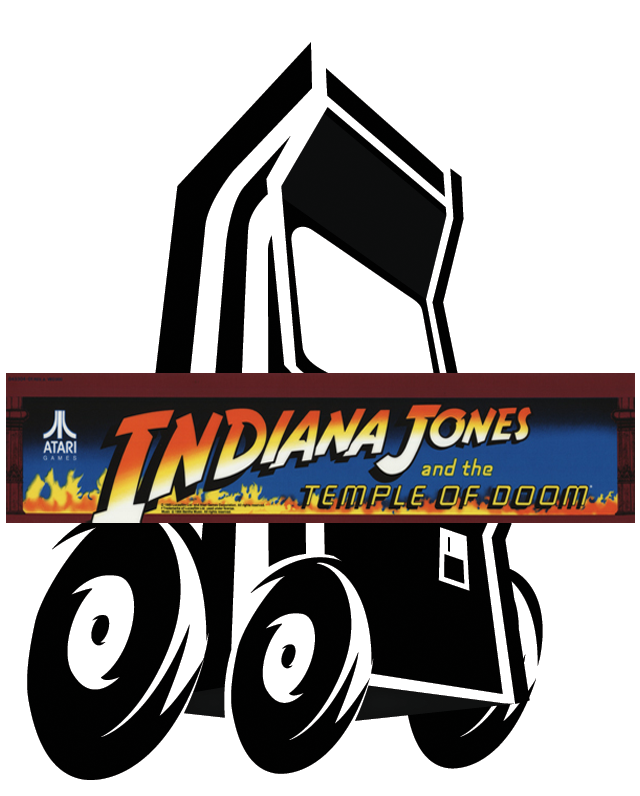 In the Temple of Doom, Indy must reach the Sankara Stone which is placed in front of the statue of Kali, the four-armed goddess of death. Once the stone is retrieved, Indy exits into the mine caverns. The action continues until Indy recovers 3 stones. Indy is then faced with escaping over a perilous rope bridge. A "bonus round" is awarded if the escape is successful. H: 70", W: 25.25", D: 34.5"